08-Mar-2008 -- This is a continuation from 13N 0. Why did we look at the stars all night? Because it was so terribly cold during the night that we hardly slept! We broke camp (east of Samou) before dawn. By 6 a.m. we were on the road. At 6:40 a.m. we went through Liptougou hoping to find the road heading south to Gayéri. This road proved to be quite elusive. We were on the "R9" for a while before it morphed into the "N24", which in turn completely disappeared after a short distance. Abandoning any attempt to relocate the "road" we began to trek through the woods on poorly maintained donkey cart paths, barely large enough for a vehicle in some places. Dodging trees, stumps, branches, rocks and other obstacles proved to be a challenge. Finally, 8 hours after we cranked the truck, we covered the "100 kilometers (66 miles)" and were able to park within 800 meters (½ mile)of the point. Traversing a deep crevice and scaring a camel made this trek more interesting. Photos were made and we quickly returned to truck. The temperature at mid-day was over 42°C! Leaving this point, we located a decent loose dirt path which took us to Gayéri. Based on the isolation and condition of the road, it was easy to see how bandits could take advantage of unwary travelers. From Gayéri, there was a "market truck" road that led all the way to the N18. The N18 was the road we took the previous day leaving Fada. We made it to Fada at 5:45 p.m. with little more than a few liters of diesel fuel left. We enjoyed a very nice supper at "The Safari Camp" and an even nicer night's rest at the SIM guesthouse. Continue on to 12N 2E for the next part of the story. #7: Surprised to see us or are we surprised to see him? 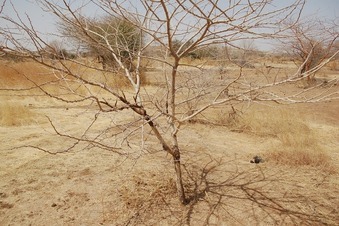 The borderline with Niger is passing about 2.9 km NE of the Confluence.